I’m still making the most of the poppies that grew in my garden and I decided to try out my new hose pipe (bought for £4 from Tesco yesterday). I took the Elincrom D-Lite flash outdoors and positioned it to the right and behind the poppy heads. I then set the Pentax K20D camera up in front and at a distance using the Tamron 500mm Mirror lens for the tight frame. 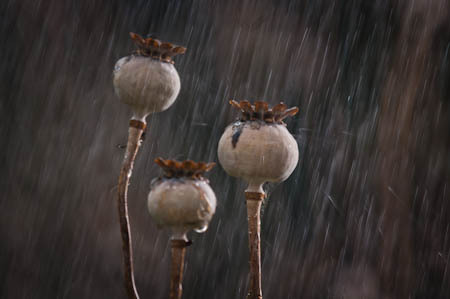 I then set the hose going and pointed it upwards so the water went up and then fell down over the poppy heads to give the effect of rain.